Lightly restore and protect your trim pieces! Gyeon Preserve will help you restore and protect your trim pieces with an easy to use spray on formula. Properly cared for trim can add that extra level of contrast that really brings your detail to the next level. The issue with trim however, is that once it becomes faded, it can be hard to restore it back to that like new, dark, deep, finish that we all love. With Gyeon Preserve, you can not only restore lightly faded trim, but take care of your trim before it ever gets to that ugly faded color. Gyeon recommends cleaning your trim with Vinyl Cleaner to start. Make sure that the surface is well cleaned and wipe dry before application. Rub a moderate amount of Preserve evenly onto the trim piece and you will love the dark, deep finish that is left behind. If the finish is too glossy, wipe with a microfiber cloth after a few minutes. Use this product on rubber (tires, seals, hoses), vinyl (dashboard, doors, interior and exterior trim, engine casings), plastic (gauges, grills, trim) and more. 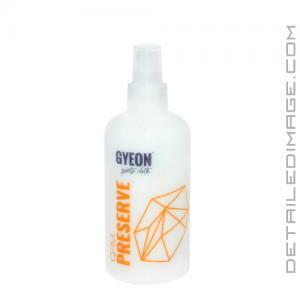 Don't let your trim fade with harmful UV rays, keep it protected and looking new with the Gyeon Preserve! Fast way to refresh and protect your trims. 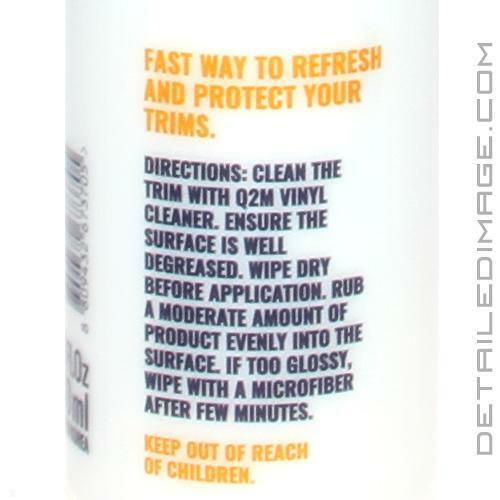 Clean the trim with Q2M Vinyl Cleaner. Ensure the surface is well degreased. Wipe dry before application. Rub a moderate amount of product evenly into surface. If too glossy, wipe with a microfiber after few minutes. This stuff is awesome! I have used it on several cars and it will make the trim look like brand new again and has held up for several washes! I have not tried it on heavily faded trim but I imagine it would do a decent job. This is more for "preserving" trim by keeping it protected, but it really makes it look like new again. Highly recommend! This has become one of my favorite products to dress the interior. It can restore those older interior dashes to some extent. The finish it leaves is an OEM matte finish. No glare visible on the glass when the sun comes through the windshield. Excellent interior product. I recommend it.